Anyone who has heard me speak knows that I believe business acumen is the most important capability for a successful selling. One of my goals in writing this blog is to support the development of business acumen in the sales process. I started reading the book Seizing the White Space: Business Model Innovation for Growth and Renewal. I found the title interesting because I often advise executives to "seek the white space." I'll provide a more detailed review of the book when I've finished reading it. 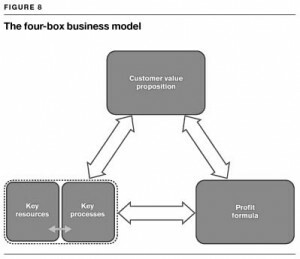 However, regardless of the rest of the book, Chapter 2, The Four-Box Business Model Framework, is must read for everyone. Understanding your customer/prospect's business model is critical - I repeat CRITICAL - to becoming indispensable. If you don't understand, you cannot make The Shift to selling results, and you'll find your company, your offerings, and your sales efforts increasingly marginalized. Which boxes do we impact? How do we impact them? How will our customers business model improve as a result of our impact? With those answers in place, your customers will be far more interested in talking with you and far more open to sharing their needs with you.